An electrical generator is a device that converts mechanical energy to electrical energy, generally using electromagnetic induction. The source of mechanical energy may be a reciprocating or turbine steam engine, water falling through a turbine or waterwheel, an internal combustion engine, a wind turbine, a hand crank, or any other source of mechanical energy. Today, generators are used in many different machines and have led to many modern advances. In the future, we may see electrical generators become smaller with larger outputs. At some point, though, they may become obsolete if electrical energy is generated directly by an alternative energy source. 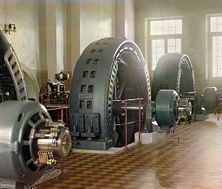 Early twentieth-century alternator made in Budapest, Hungary, in the power generating hall of a hydroelectric station. Charge created by the triboelectric effect using the separation of two insulators (the belt leaving the lower pulley). Electrostatic generators are used for scientific experiments requiring high voltages. Because of the difficulty of insulating machines producing very high voltages, electrostatic generators are made only with low power ratings and are never used for generation of commercially-significant quantities of electric power. 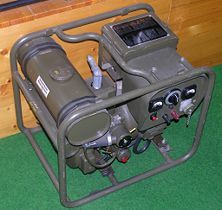 Side view of a portable generator, showing the gasoline engine. In 1831-1832, Michael Faraday discovered that a potential difference is generated between the ends of an electrical conductor that moves perpendicular to a magnetic field. He also built the first electromagnetic generator called the 'Faraday disc', a type of homopolar generator, using a copper disc rotating between the poles of a horseshoe magnet. It produced a small DC voltage, and large amounts of current. The Dynamo was the first electrical generator capable of delivering power for industry. The dynamo uses electromagnetic principles to convert mechanical rotation into an alternating electric current. A dynamo machine consists of a stationary structure which generates a strong magnetic field, and a set of rotating windings which turn within that field. On small machines the magnetic field may be provided by a permanent magnet; larger machines have the magnetic field created by electromagnets. The first dynamo based on Faraday's principles was built in 1832 by Hippolyte Pixii, a French instrument maker. It used a permanent magnet which was rotated by a crank. The spinning magnet was positioned so that its north and south poles passed by a piece of iron wrapped with wire. Pixii found that the spinning magnet produced a pulse of current in the wire each time a pole passed the coil. Furthermore, the north and south poles of the magnet induced currents in opposite directions. By adding a commutator, Pixii was able to convert the alternating current to direct current. Unlike the Faraday disc, many turns of wire connected in series can be used in the moving windings of a dynamo. This allows the terminal voltage of the machine to be higher than a disc can produce, so that electrical energy can be delivered at a convenient voltage. The relationship between mechanical rotation and electric current in a dynamo is reversible; the principles of the electric motor were discovered when it was found that one dynamo could cause a second interconnected dynamo to rotate if current was fed through it. Ányos Jedlik's single pole electric starter (dynamo) (1861). In 1827, Anyos Jedlik started experimenting with electromagnetic rotating devices which he called electromagnetic self-rotors. In the prototype of the single-pole electric starter (finished between 1852 and 1854) both the stationary and the revolving parts were electromagnetic. He formulated the concept of the dynamo at least 6 years before Siemens and Wheatstone. In essence the concept is that instead of permanent magnets, two electromagnets opposite to each other induce the magnetic field around the rotor. Both of these designs suffered from a similar problem: they induced "spikes" of current followed by none at all. Antonio Pacinotti, an Italian scientist, fixed this by replacing the spinning coil with a toroidal one, which he created by wrapping an iron ring. This meant that some part of the coil was continually passing by the magnets, smoothing out the current. Zénobe Gramme reinvented this design a few years later when designing the first commercial power plants, which operated in Paris in the 1870s. His design is now known as the Gramme dynamo. Various versions and improvements have been made since then, but the basic concept of a spinning endless loop of wire remains at the heart of all modern dynamos. The generator moves an electric current, but it does not create electric charge, which is already present in the conductive wire of its windings. It is somewhat analogous to a water pump, which creates a flow of water but does not create the water itself. Other types of electrical generators exist, based on other electrical phenomena such as piezoelectricity, and magnetohydrodynamics. The construction of a dynamo is similar to that of an electric motor, and all common types of dynamos could work as motors. The parts of a dynamo or related equipment can be expressed in either mechanical terms or electrical terms. Although distinctly separate, these two sets of terminology are frequently used interchangeably or in combinations that include one mechanical term and one electrical term. This causes great confusion when working with compound machines such as a brushless alternator or when conversing with people who are used to working on a machine that is configured differently than the machines that the speaker is used to. Rotor: The rotating part of an alternator, generator, dynamo or motor. Stator: The stationary part of an alternator, generator, dynamo or motor. Armature: The power-producing component of an alternator, generator, dynamo or motor. The armature can be on either the rotor or the stator. Field: The magnetic field component of an alternator, generator, dynamo or motor. The field can be on either the rotor or the stator and can be either an electromagnet or a permanent magnet. The maximum power theorem applies to generators as it does to any source of electrical energy. This theorem states that the maximum power can be obtained from the generator by making the resistance of the load equal to that of the generator. However, under this condition the power transfer efficiency is only 50 percent, which means that half the power generated is wasted as heat inside the generator. For this reason, practical generators are not usually designed to operate at maximum power output, but at a lower power output where efficiency is greater. 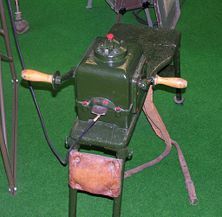 Early motor vehicles tended to use DC generators with electromechanical regulators. These were not particularly reliable or efficient and have now been replaced by alternators with built-in rectifier circuits. These power the electrical systems on the vehicle and recharge the battery after starting. Rated output will typically be in the range 50-100 A at 12 V, depending on the designed electrical load within the vehicle—some cars now have electrically-powered steering assistance and air conditioning, which places a high load on the electrical system. Commercial vehicles are more likely to use 24 V to give sufficient power at the starter motor to turn over a large diesel engine without the requirement for unreasonably thick cabling. Vehicle alternators usually do not use permanent magnets; they can achieve efficiencies of up to 90 percent over a wide speed range by control of the field voltage. Motorcycle alternators often use permanent magnet stators made with rare earth magnets, since they can be made smaller and lighter than other types. Some of the smallest generators commonly found are used to power bicycle lights. These tend to be 0.5 A permanent-magnet alternators, supplying 3-6 W at 6 V or 12 V. Being powered by the rider, efficiency is at a premium, so these may incorporate rare-earth magnets and are designed and manufactured with great precision. Nevertheless, the maximum efficiency is only around 60 percent for the best of these generators—40 percent is more typical—due to the use of permanent magnets. A battery would be required in order to use a controllable electromagnetic field instead, and this is unacceptable due to its weight and bulk. Sailing yachts may use a water or wind powered generator to trickle-charge the batteries. A small propeller, wind turbine or impeller is connected to a low-power alternator and rectifier to supply currents of up to 12 A at typical cruising speeds. An engine-generator is the combination of an electrical generator and an engine mounted together to form a single piece of equipment. This combination is also called an engine-generator set or a gen-set. In many contexts, the engine is taken for granted and the combined unit is simply called a generator. In addition to the engine and generator, engine-generators generally include a fuel tank, an engine speed regulator and a generator voltage regulator. Many units are equipped with a battery and electric starter. Standby power generating units often include an automatic starting system and a transfer switch to disconnect the load from the utility power source and connect it to the generator. Engine-generators produce alternating current power that is used as a substitute for the power that might otherwise be purchased from a utility power station. The generator voltage (volts), frequency (Hz) and power (watts) ratings are selected to suit the load that will be connected. Both single-phase and three-phase models are available. There are only a few portable three-phase generator models available in the US. Most of the portable units available are single phase power only and most of the three-phase generators manufactured are large industrial type generators. Engine-generators are available in a wide range of power ratings. These include small, hand-portable units that can supply several hundred watts of power, hand-cart mounted units, as pictured above, that can supply several thousand watts and stationary or trailer-mounted units that can supply over a million watts. The smaller units tend to use gasoline (petrol) as a fuel, and the larger ones have various fuel types, including diesel, natural gas and propane (liquid or gas). When using engine-generators, you must be aware of the quality of the electrical wave it outputs. This is particularly important when running sensitive electronic equipment. A power conditioner can take the square waves generated by many engine-generators and smooth it out by running it through a battery in the middle of the circuit. Using an inverter rather than a generator may also produce clean sinusoidal waves. There are several quiet running inverters available that produce clean sinusoidal wave power suitable for use with computers and other sensitive electronics, however some low cost inverters do not produce clean sinusoidal waves and may damage certain electronic charging equipment. 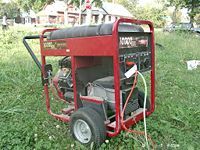 Engine-generators are often used to supply electrical power in places where utility power is not available and in situations where power is needed only temporarily. 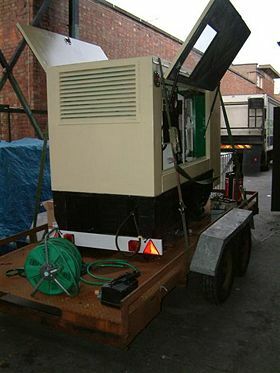 Small generators are sometimes used to supply power tools at construction sites. Trailer-mounted generators supply power for lighting, amusement rides etc. for traveling carnivals. Standby power generators are permanently installed and kept ready to supply power to critical loads during temporary interruptions of the utility power supply. Hospitals, communications service installations, sewage pumping stations and many other important facilities are equipped with standby power generators. Small and medium generators are especially popular in third world countries to supplement grid power, which is often unreliable. Trailer-mounted generators can be towed to disaster areas where grid power has been temporarily disrupted. The generator can also be driven by the human muscle power (for instance, in the field radio station equipment). The mid-size stationary engine-generator pictured here is a 100 kVA set which produces 415 V at around 110 A per phase. It's powered by a 6.7 litre turbocharged Perkins Phaser 1000 Series engine, and consumes approximately 27 litres of fuel an hour, on a 400 litre tank. Stationary generators used in the US are used in size up to 2800 kW. These diesel engines are run in the UK on red diesel and rotate at 1500 rpm. This produces power at 50 Hz, which is the frequency used in the UK. In areas where the power frequency is 60 Hz (United States), generators rotate at 1800 rpm or another even multiple of 60. Diesel engine-generator sets operated at their best efficiency point can produce between 3 and 4 kilowatthours of electrical energy for each liter of diesel fuel consumed, with lower efficiency at part load. Side view of a large Perkins diesel generator, manufactured by F&G Wilson Engineering Ltd. This is a 100 kVA set. U.S. Patent 222,881 (PDF)—Magneto-Electric Machines : Thomas Edison's main continuous current dynamo. The device's nickname was the "long-legged Mary-Ann." This device has large bipolar magnets. It is inefficient. U.S. Patent 373,584 (PDF)—Dynamo-Electric Machine : Edison's improved dynamo which includes an extra coil and utilizes a field of force. U.S. Patent 359748 (PDF)—Dynamo Electric Machine - Nikola Tesla's construction of the alternating current induction motor / generator. U.S. Patent 406968 (PDF)—Dynamo Electric Machine - Tesla's "Unipolar" machine (i.e., a disk or cylindrical conductor is mounted in between magnetic poles adapted to produce a uniform magnetic field). U.S. Patent 447920 (PDF)—Method of Operating Arc-Lamps - Tesla's alternating current generator of high frequency alternations (or pulsations) above the auditory level. U.S. Patent 447921 (PDF)—Alternating Electric Current Generator - Tesla's generator that produces alternations of 15000 per second or more. Boldea, Ion. 2005. Synchronous Generators (Electric Power Engineering Series). Ottawa, ON, Canada: CRC Publications. ISBN 084935725X. Simões, M. Godoy, and F. A. Farret. 2004. Renewable Energy Systems: Design and Analysis with Induction Generators. Ottawa, ON, Canada: CRC Publications. ISBN 0849320313. Gill, Paul. 1997. Electrical Power Equipment Maintenance and Testing (Power Engineering, 4). Ottawa, ON, Canada: CRC Publications. ISBN 0824799070. This page was last modified on 18 September 2017, at 21:43.